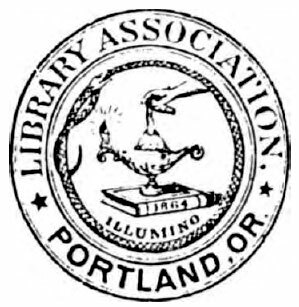 What is the true meaning of the curious, arcane symbols found in the Great Seal of the United States? Who designed this fantastic two-sided device, and why is it so prominently featured as art and decor on our most common item of currency ~ the U.S. one dollar bill? The symbols on the Great Seal at first glance seem to be incompatible with the history, political organization, and religious heritage of our great nation. An Egyptian pyramid? What has that to do with America? Strange Latin inscriptions? A bizarre all-seeing eye radiated by the sun's rays? Odd, indeed. Truly weird, especially, is the fact that there are two sides to the Great Seal. The front side pictures a strong, war-ready eagle with a constellation of stars in a cloud above its head. The reverse, the mystical side, is the one with the pyramid, Latin inscriptions, all-seeing eye, etc. Why two sides? After all, a seal is like a rubber stamp. It is used to authenticate documents to prove authenticity and affirm veracity and genuineness. You don't need a reverse side on a "rubber stamp!" In fact, both sides of the Great Seal, each with various images, have been around since the days of the Continental Congress. That, of course, is the official version of events. 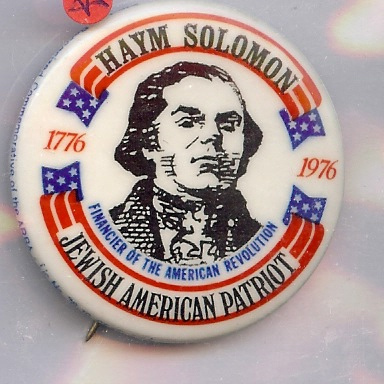 But some claim that a mysterious man from Europe, but living in Philadelphia, named Haym Salomon, secretly assisted the committee of Franklin, Jefferson, and Adams. 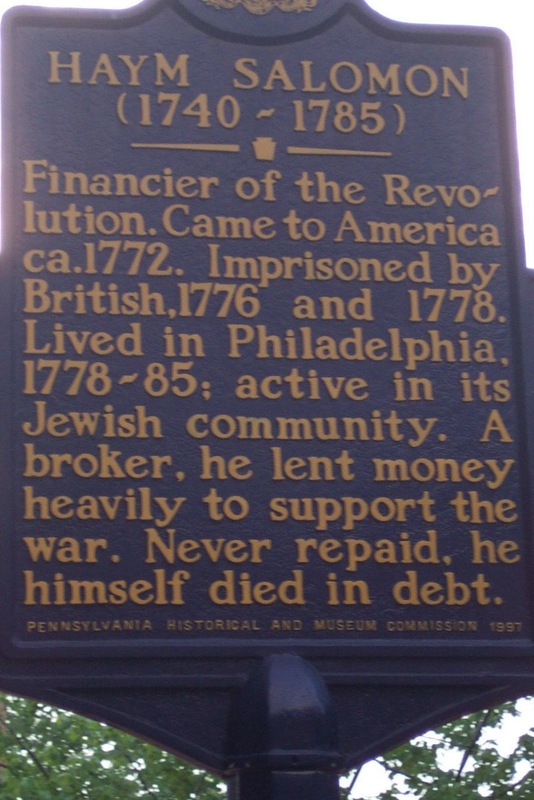 Haym Salomon, a Jewish banker, just happened to be the American representative for the Rothschilds of Europe. 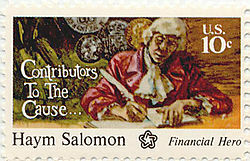 Salomon, it is said, bribed a number of American politicians and was able to get about anything he and his mentors wanted done. 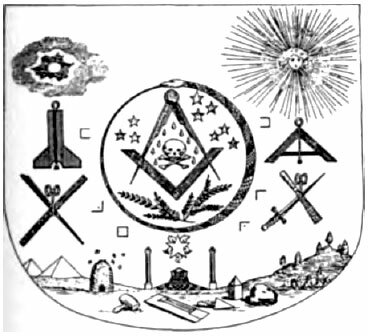 In the case of the Great Seal, the Rothschilds wanted symbols to be pictured in the Great Seal of United States befitting the aims of the Illuminati. Though Jewish and Zionist in ambition, the Rothschilds were not worshippers of the God of the Old and New Testaments of the Bible. They were Sabbatian/Frankist (Satanic) in theology. They sought (and still today seek) a Jewish Utopia or Kingdom on planet Earth. This Kingdom would be the New Age successor to ancient Babylon and Egypt. It would be a powerhouse nation that would, through magic and intellect, conquer the world. America would be its proxy. America would be its alter ego. America, then, must be fashioned into a cabalistic, Jewish state. All Hail the New Egypt, Empire of the Ages, child of the Sun God of the ancients! America, the New Jerusalem, must unite with Old Jerusalem, and the Zionist Illuminati must reign! Rothschild agent Haym Salomon had millions of dollars of largesse to spread around in bribes. And so he did. A good portion of the money went to fund the Continental Congress and its operations. Some went into the Treasury for the Revolutionary War effort. Some went into politicians' pockets. 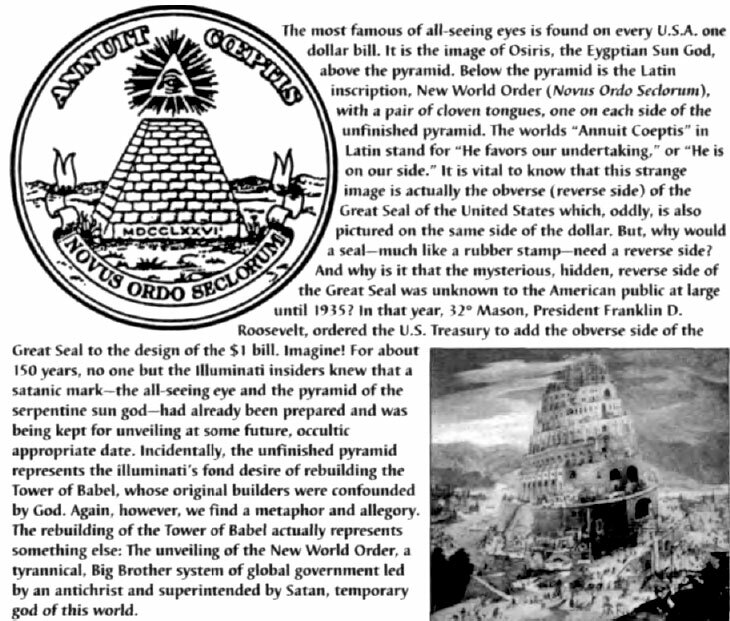 Rothschild eventually got the images he had demanded on the Great Seal, though not without opposition. The design was bitterly opposed by the few who recognized the Masonic and Illuminist elements. The ultimate goal of the Illuminati is to eventually bring Haym Salomon out of the closet, so to speak. Someday, his name will be in lights. He'll be immortalized in print, in movies, and on TV as a great and noble hero, akin to a George Washington or Thomas Jefferson. Statues will be built to honor him. One already has, in Philadelphia. Mark my words and mark your calendar for the future and see if what I tell you isn't so. Now, let us examine the symbols on America's Great Seal and see if we can make sense of their true, esoteric meaning and purposes. Let us wipe away the gloss and get down to the base surface to better understand. This is vital because of the future of the United States ~ and the destiny of all humanity ~ is wrapped up, and is revealed, in this collection of Illuminist symbols and marks. 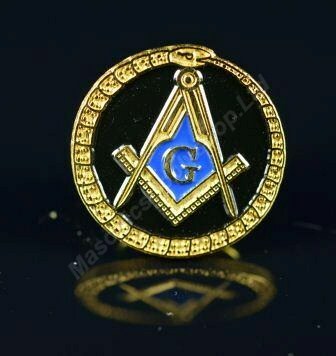 Masonry is a peculiar Egypto-Babylonia-Jewish institution, and so the pyramid itself hearkens back to the Dynasty of the pharaohs and to the Gods and Goddesses of ancient Egypt. The stones which make up the pyramid are also of esoteric significance. In the Masonic philosophy it is taught that unenlightened man is in a rude, natural state. Having little or no "light" and without the spiritual illumination offered by the Mystery Religions he is likened to an imperfect or rough ashlar stone. But once enlightened and illuminated, he is crafted into a man of education, sophistication, discipline, and culture. He reaches upward toward spiritual perfection. He is then a perfect ashlar stone. Likewise, the higher level Masons discover that the pyramid reflects, or parallels, the New World Order (Novus Ordo Seclorum) they and their Illuminized superiors are building under the watchful eye of the Great Architect of the Universe, whose secret and sacred name, the Royal Arch Mason learns, is Jahbuhlun. The Builders (the Perfect Ashlars), then, are the Illuminati and their minions. Their building project is the renovation and reconstruction (Perestroika or Tikkun Olam) of the whole earth. It is when this ambitious goal is achieved that, symbolically, the capstone will be set in place atop the pyramid. Then he who lies within the living stones shall come forth to rule. The Phoenix (Satan and his "son") shall rise from the flames of destruction just as the legendary phoenix bird arose. The Phoenix, however, is, in reality a cockatrice, a dragon-bird, a flying serpent. The word "pyramid," incidentally, literally means "amidst the fire." And now you know the true, occultic meaning of the word. Simply put, Freemasons, under the direction of Haym Salomon, Ben Franklin, and others, designed the Great Seal with its all-seeing eye in the capstone amidst the radiant sun background. 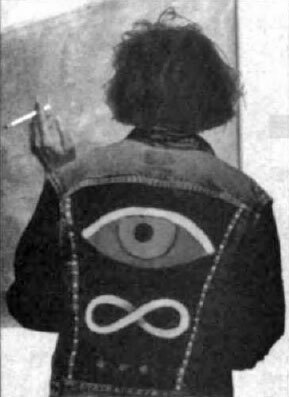 As followers of Egyptianism, it has long been assumed that the eye is that of Osiris, the Egyptian sun God, and/or of his son, Horus. This is true, but there is much more. The Illuminati and their subordinates, the Masons, honor the Deity of countless names. Yes, one of those names is Osiris, with his son Horus. But the Illuminati Deity is a concealed God who hides his true identity in a multitude of disguises and subterfuges. He is called "The Sun," the "Central Sun," "Hiram Abiff," the one with the "Ineffable Name," "Ein Soph," the "Great Architect of the Universe," "Abaddon," "Mahabone," and "Jahbuhlun." Ostensibly the Illuminati worship a pantheon, a multiplicity of Gods. But, not so. These are all fronts for the elite worship of Lucifer. He is their true God, the God of Light. As Albert Pike stated in Morals and Dogma, "Doubt it not." That is, the Oroboros serpent. He is to be thanked, Blavatsky says, for setting men on the path to divinity and liberty. It is, she emphasizes, the Cabala that "unveils the secret." To what secret is she referring? The serpent, or Satan, as we know from the scriptures, is God of the dead. He is graphically pictured in the occult world as a serpent biting his own tail; how appropriate: A devourer of himself! And that is what actually happens when a person defies God and worships the Adversary. He or she is "biting his own tail" — tragically and pathetically devouring himself. The oroboros, or serpent biting its own tail, is pictured on the cover of Codex Magica. This book unmasks the Illuminati worship of this detestable creature, a worship of which virtually every person on earth is dangerously and hopelessly unaware. Since the Illuminati, Masons, and fellow cabalists have amassed such tremendous political, financial, social, and technological powers, is it not a frightening thing to realize that these men are not only religious, their religion is Satanism, and their God is the Devil? The destructive path, therefore, is the way of the Illuminati. As I have demonstrated, these wicked agents of the Serpent are psychopaths and present a clear and present threat and danger to our lives. But the gravest danger is that which confronts the souls of billions of unsaved, ignorant human beings. If they fall for the Lie of the Serpent, they will suffer total destruction and suffer loss for eternity. Later, in the photos and illustrations presented in this chapter, you will discover the startling artwork on a Jewish New Year's postcard by Jewish artist Alain Roth back in 1915. The design shows the Oroboros Serpent (Satan) encircling and conquering the whole earth. Happy New Year? As I have proven over and over by a preponderance of documentation, we cannot separate the murderous goals and activities of the Illuminati from their religious belief system. Their inspiration, their fanatical zealotry, comes from their teacher, Satan, who has given them a thorough set of instructions ~ an UnBible if you will, in the Jewish Cabala. In this UnBible the Serpent plays the key role. He is praised as the "Serpent of Wisdom." The destiny of the Illuminati and the whole world is said to be in his hands. (3)The three dots, or points, indicative of the unholy trinity. 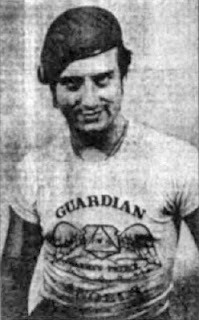 The Guardian Angel organization in New York City has as its logo an all-seeing eye in a triangle, and angel wings. Reason (La Raison), an engraving by Darcis in the National Museum, Paris, France, was said to capture the spirit of the bloody, Illuminati-inspired French Revolution. 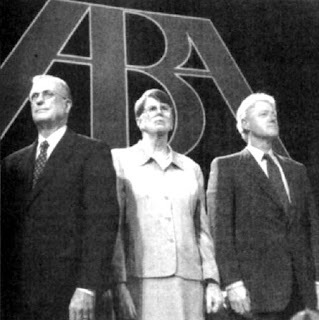 What we see is symbolism of the unholy trinity of Lucifer-Father (Lion), Mother (Goddess), and Son (allseeing eye). Art illustration from the book, Active Meditation, by Robert Leichtman, M.D. and Carl Japikse (Ariel Press). 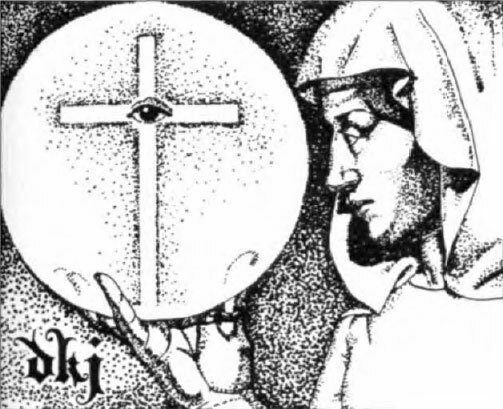 The hermetic monk holds the solar disk with cross and all-seeing eye. This bizarre advertisement for cable-TV's The Learning Channel. 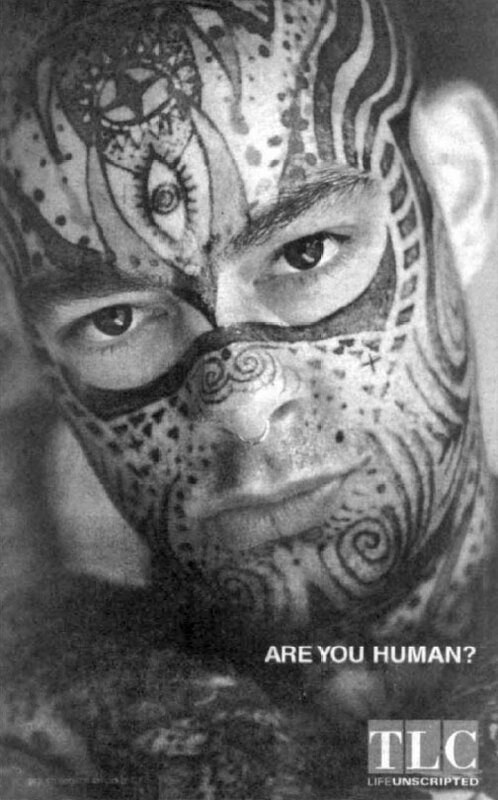 The tattoos on this man are real. The all-seeing eye is in what Hindus call the "ajna center," in the midpoint of the forehead just above the eyebrows. Sir Walter Raleigh, the impetuous adventurer and polished courtier, was also a man of considerable literary accomplishments. Much of the poetry he wrote has been lost, but several impressive prose works survive. The most ambitious and distinguished of these is The History of the World, written between 1607 and 1614, during his years of confinement in the Tower of London under a death sentence. Although Raleigh's name did not appear on the elaborately engraved frontispiece to the first edition (above), there was no secret about the authorship. 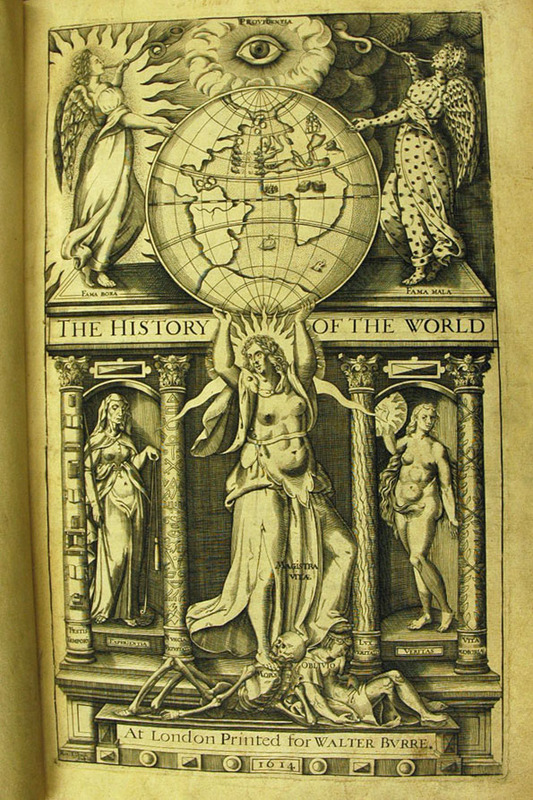 The book was immediately banned by King James I.
Raleigh set out to write a universal chronicle that would parallel the Old Testament chronology in its initial chapters but bring the story up to his own times, in which the history of England would be related to that of the rest of the world. He got only as far as the fall of Macedonia in 130 B.C. James's displeasure was caused by Raleigh's portrayals of Assyrian Queen Semiramis, which was seen as a tribute to Elizabeth I, and of her effeminate successor, Ninus, which the king interpreted as an unflattering caricature of himself. Sir Walter Raleigh's distinguished book, The History of The World (written between 1607 and 1614) had this illustration as its frontispiece. The book was banned by England's King James I because it revealed too much, ostensibly for its portrayals of Babylonian Queen Semiramis and her effeminate son, Ninus. 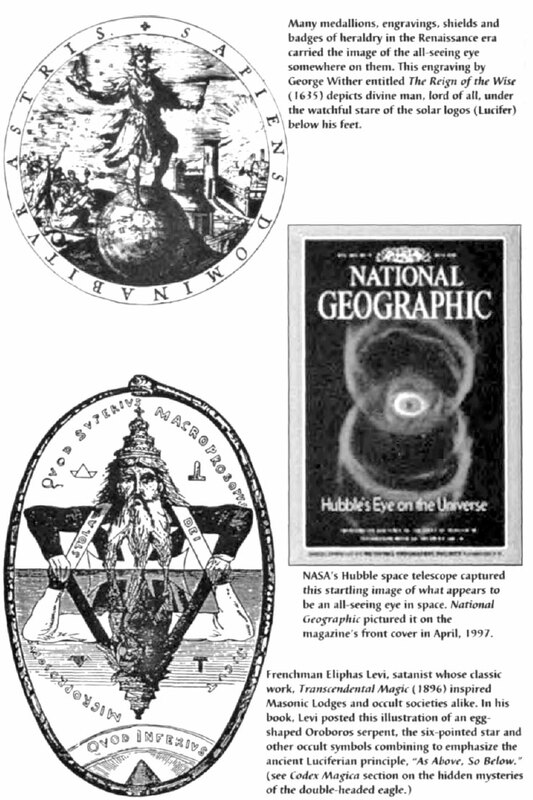 More likely is that the artwork shown here revealed far too many occult secrets, including the androgynous (male/female) figure holding aloft the globe, the all-seeing eye, etc. 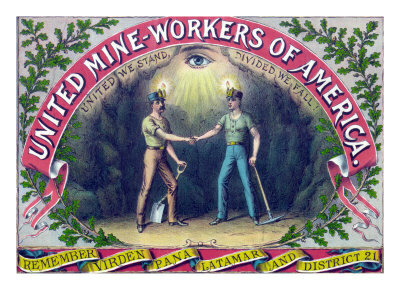 United Mine Workers Union poster, 1890. The two miners are exchanging a Masonic handshake, being overseen by the all-seeing eye. Almost all unions in America and Europe were founded by Jewish activists deep into Cabala, Masonry, and other occult secrets. Three versions of Oroboros, the circular serpent biting its own tail. Far Above left: This version is from Atlanta Fugiens, by Michael Maier, 1618. Far Above right: This version of Oroboros is from Dahomey, West Africa. Above: An early, hand-painted Masonic apron depicts many occult symbols, including the serpent Oroboros, the skull and bones, pentacle stars, the pyramids, the mallet, and the X. 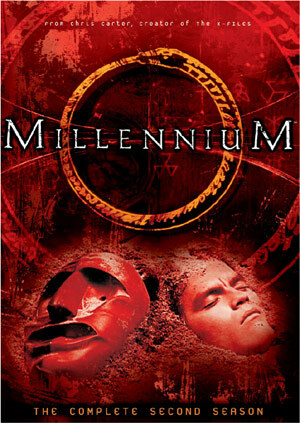 The Fox-TV network ran 67 episodes of the popular series, Millennium. 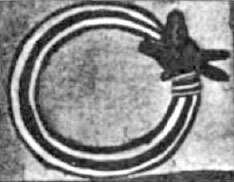 The Oroboros serpent was the focal point of advertising for the series though the occult meaning of the symbol was never fully explained. 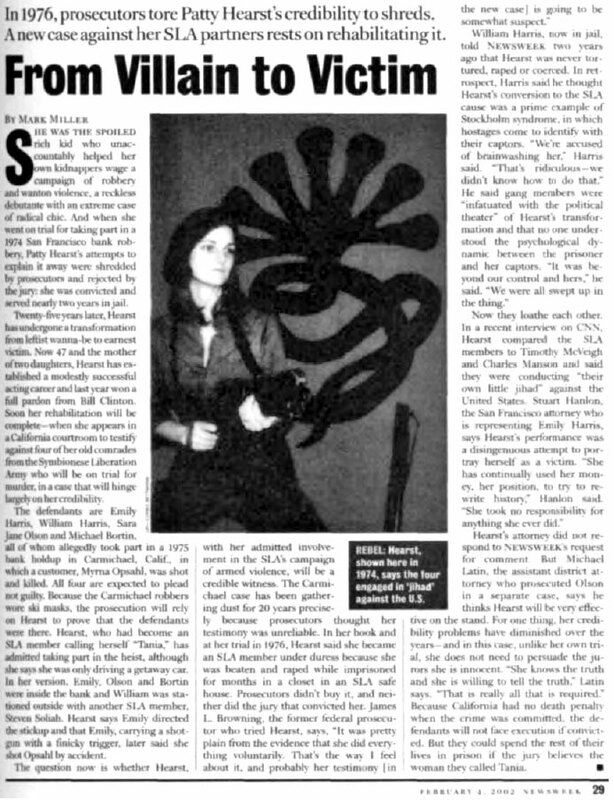 In 1974, heiress Patty Hearst was kidnapped by members of a group calling itself the Symbionese Liberation Army (SLA). 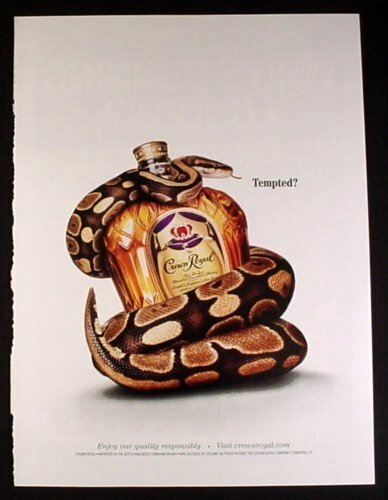 Blatant serpent wickedness is rampant in this advertisement for Crown Royal whiskey. We have the regal scarlet crown, the diamond cuts on the glass, the evil snake shaped in the form of "S" (Satan? ), and the one word question, "Tempted?" The phrase below, "Enjoy our quality responsibly" sounds like some kind of hellish joke. Crown Royal is manufactured by Seagram & Sons, the world's largest distillery. Seagram is owned by the Bronfman bloodline dynasty of Canada, the family of ardent ADL Jewish Zionists. Its senior is currently Edgar Bronfman, who also just happens to be chairman of the World Jewish Congress. The dragon is, of course, a mythical form of serpent. Indeed, the Bible in the book of Revelation describes Satan as "that old serpent, the dragon." 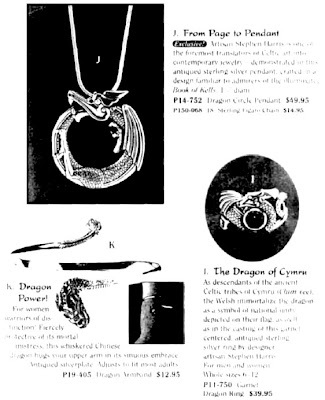 Well, for those who wish to pay homage to the dragon, The Pyramid Collection catalog offers such jewelry items as this pendant, ring, and arm band. 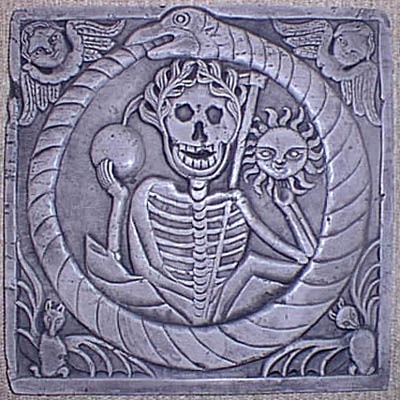 "In the mythology of the primitive world, the serpent is universally the symbol of the sun... As the sun was the enlightener of the world, so the serpent was held to have been the great enlightener of the spiritual, by giving mankind knowledge of good and evil." 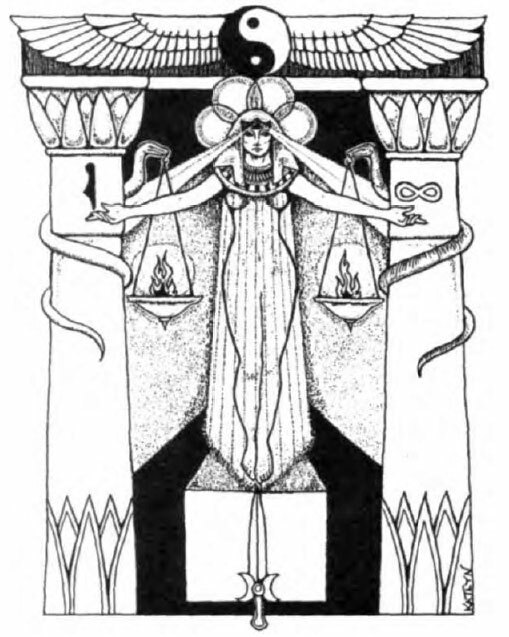 Revealing drawing from a New Age magical publication, New Moon Rising. The yin/yang circle at top has the backward "S" and the black is white, white is black motif; and we discover the veiled Goddess, in addition to two serpents facing each other. Again, this emphasizes the occult principle of joining, or integrating of opposites. The author of Codex Magica could give about a 60-hour lecture series devoted exclusively to the meaning of all the symbols in this seductively evil ~ even grotesque ~ piece of occult art. Singer/Entertainer Britney Spears used this white python serpent in one of her music videos. Some in witchcraft falsely believe the white snake is the possessor of good magical powers because of its "pure" color. 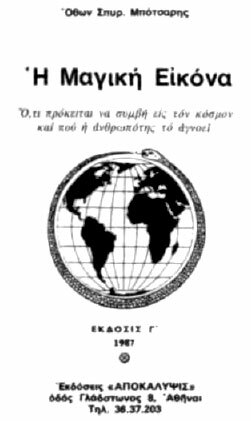 The title page of a book published in Greece exposing the global plot of the Zionist Masons of the Illuminati. 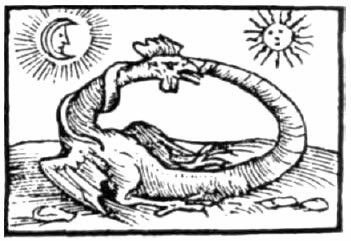 The authors demonstrate their understanding by the symbolic use of the evil oroboros serpent encircling the whole world. 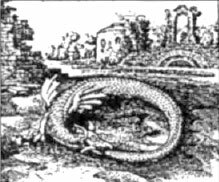 The Oroboros, the serpent coiled up in a circle biting its own tail (also Uroboros), is pictured as a Gnostic rooster combination creature in this illustration from Horapollo's Selecta Hieroglyphica, 1597. 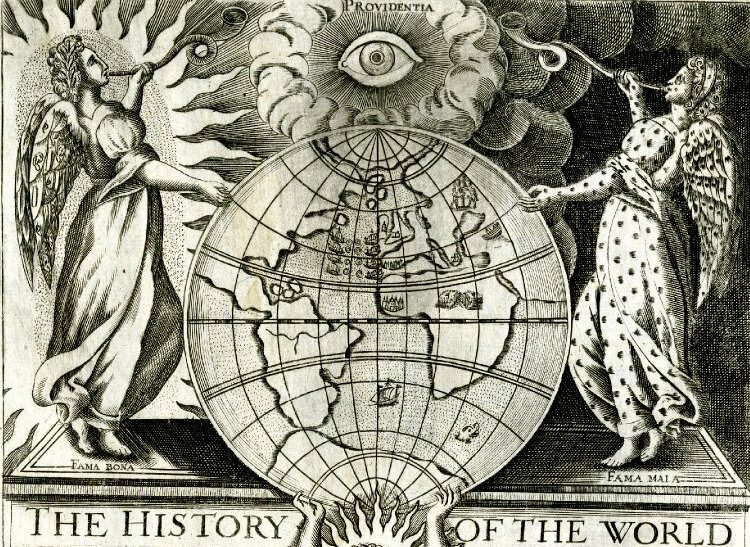 The sun and moon symbolize the conjunction of opposites, which is the alchemical doctrine of Illuminism. These two ancient Celtic coins from Bohemia (second and first centuries B.C.) bear the marks of the dragon, or serpent. 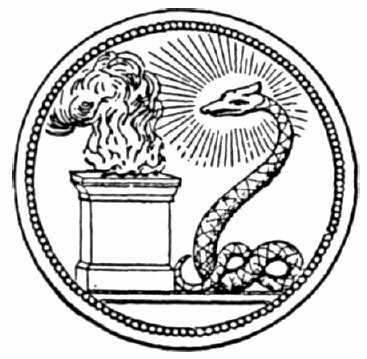 The first coin has the image of an oroboros serpent/dragon torqued and prepared to bite its own tail. 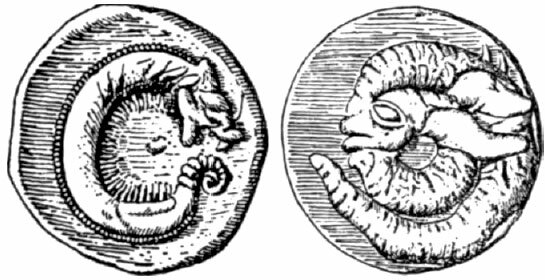 The second coin bears the image of a coiled, horned serpent with ears. 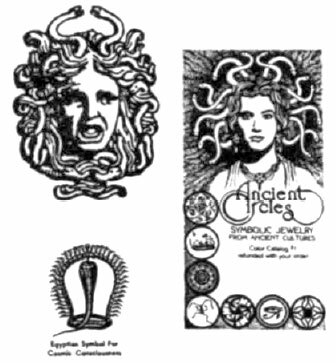 The coins signify the adoration and homage paid the serpent as a religious icon of worship-status by the Mystery Religions. 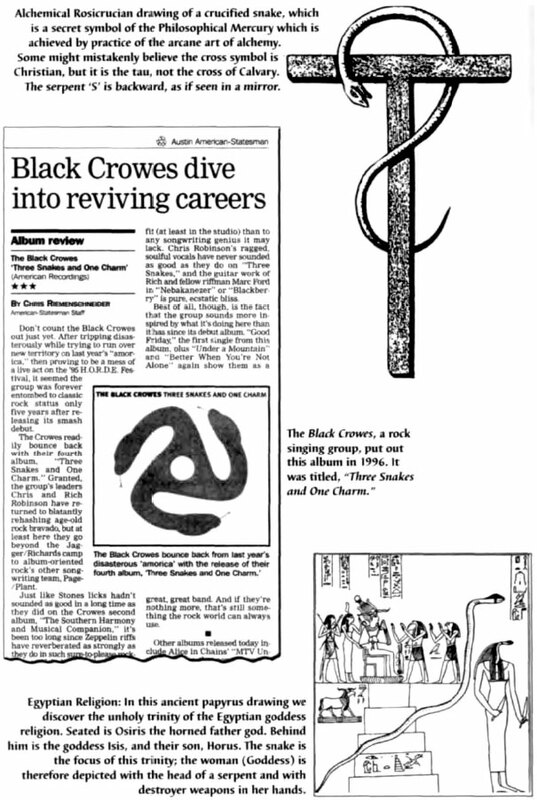 The revival today of the ancient Mystery Religions is accompanied also by modern-day advances in serpent worship. This is a Jewish New Year postcard, by artist Alain Roth in 1915. Amazingly revealing, the postcard image confirms the documentation found in the long controversial Protocols of the Learned Elders of Zion. In the protocols the Jewish Zionist conspiracy is described as a symbolic serpent encircling the world! 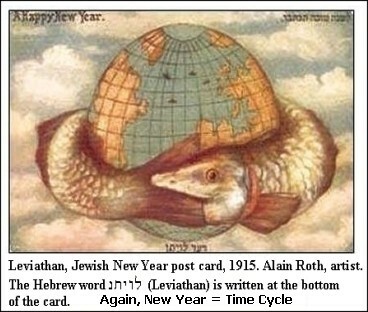 As if to emphasize that this is the correct understanding, the writing in Hebrew at the bottom of this Jewish New Year postcard is the word "Leviathan." The identity of Leviathan is revealed in Isaiah 27 as the serpent, or Satan. Have a Happy New Year, indeed! The Illuminati's architectural concept of the unfinished pyramid (the capstone yet to be fused on top) is exactly captured in this intriguing, obviously staged ritual image. This photo, from the American Bar Association's (ABA) annual convention in 1999, shows attorney Philip Anderson (left), president of the ABA, Janet Reno, Attorney-General of the United States, and President Bill Clinton. 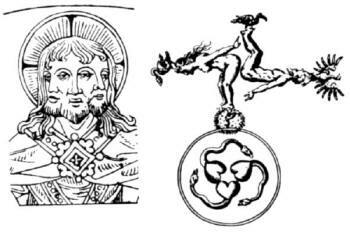 From The Herder Dictionary of Symbols (Chiron Publications, Illinois), we have two different representations of the alchemical/mystical concept of "trinity as unity."